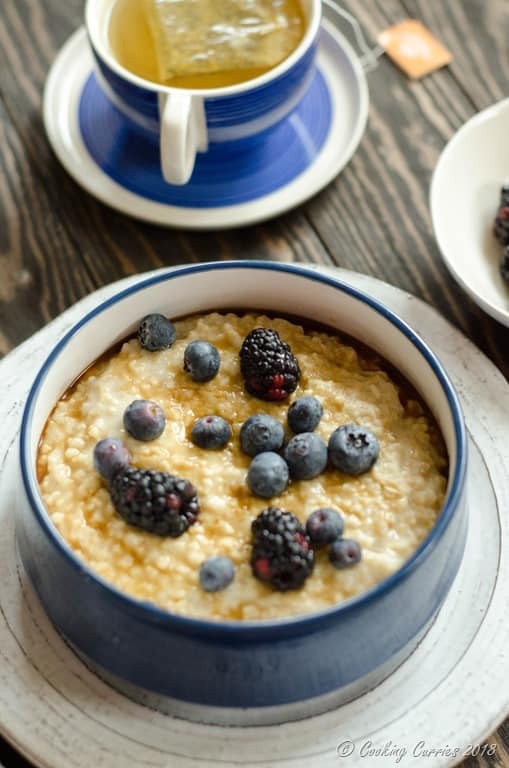 Kick start healthy mornings with this amazing Steel Cut Oatmeal made perfectly every single time with the trusty Instant Pot. By now, you all must have heard of THE INSTANT POT. If you haven’t, well, then I would safely assume that you are living in a happy little bubble of yours. No offence. Sometimes, that is a good thing too and trust me, I wish I can go into one of those every now and then. So, anyway, coming back to the Instant Pot. I have had this genius kitchen helper for about two years now, but it took me until mid last year to actually start using it. I didn’t really believe that it made cooking any easier. It took time to cook most regular things in the pressure cooker. For it to get to pressure, then cook, then wait to release the pressure. It was all, well, just too much pressure, you know! I would rather plop it in a pan on the stove top and call it a day. Secondly, whenever the pressure was released by the whistle weight while cooking, it would always make a huge mess on my stove. And also the lid, the gasket, everything got a lot of food on it and it was not the easiest job to clean out a pressure cooker. But I still owned / own a couple of stove top pressure cookers and used it occasionally. When the whole Instant Pot craze hit the world, I, of course, had to give in to it. I bought one, but it just stayed in its box in the garage for about a year. I know!!!! I joined groups on Facebook, followed conversations, to convince me to start using it. Then one fine day, I took it out and decided to give it a go. And to be honest, I do love the Instant Pot now and use it quite a lot in my everyday cooking. It is a set it and forget it gadget. You truly can put your food in to cook. Set a time and walk away to come back later to delicious food, all ready, waiting for you to dig in. Now, this is not quite possible with the traditional pressure cooker and it is one of my favorite features. It does not make a mess of my stove top, with all the spluttering and splashes of food, while cooking. This may not apply to some of you, but to those who are a lot like me, I would say this will be a great reason to go get an Instant Pot. The extra functions like yogurt, bean/chili mode etc helps in cooking a variety of foods. Cleaning is a breeze. Food does not really get to the lid of the pot when cooking, so it is easier to clean it. The inner pot is also pretty easy to clean even if some food gets stuck to it or burns a little while using in sauté mode. If all those reasons were not enough to convince you to buy the Instant Pot, there will be more coming in, in the form of delicious goodies made in the Instant Pot, real soon. 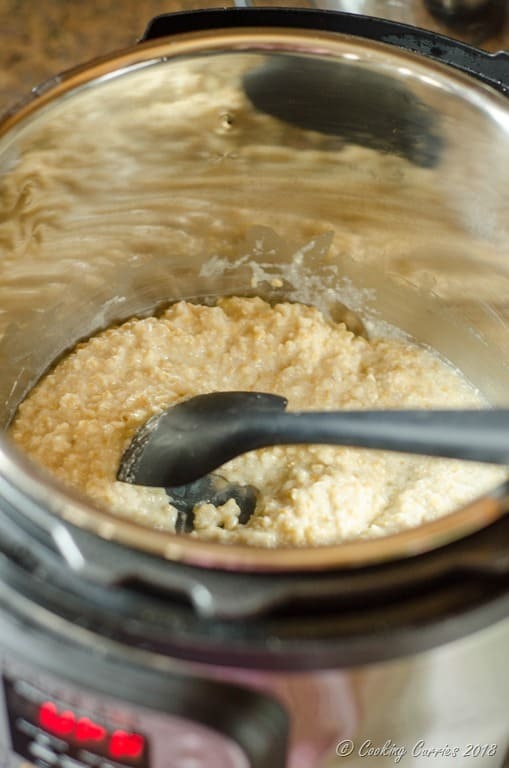 I started making this Instant Pot Steel Cut Oatmeal, after I got pregnant and I had to make sure that I did not skip any meals, especially breakfast. 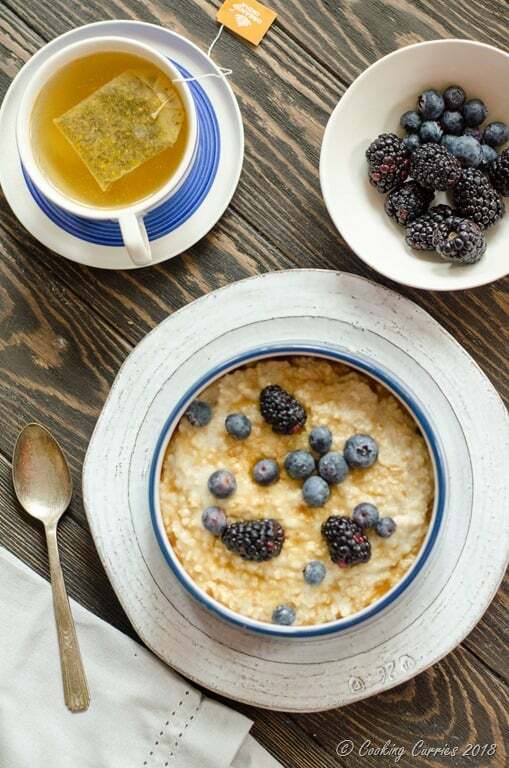 I would come down to the kitchen as soon as I wake up and put the Oatmeal in the Instant Pot to cook. It would usually take about 30 mins to be done – 10 mins to come to pressure, 10 mins to cook the oatmeal and 10 mins for the pressure to be released, which gives me enough time to brush, change, get ready and come down and make a coffee for myself. I like to toast the oatmeal in the Instant Pot before adding the liquid. Then I add liquid of my choice, usually, regular milk or unsweetened almond milk. I set it to cook and then once it is perfectly done every single time, I scoop it out into bowls and add some vanilla and mix it in. Then top with some fruits, maple syrup, sometimes nuts or coconut flakes or even granola, and my breakfast is all set. The kiddo loves this as breakfast too. So, there you go, I don’t have to make another breakfast for him. Sometimes, I also make extra and save some in the refrigerator for the husband’s breakfast the next morning. He just adds a little more milk to it before eating! 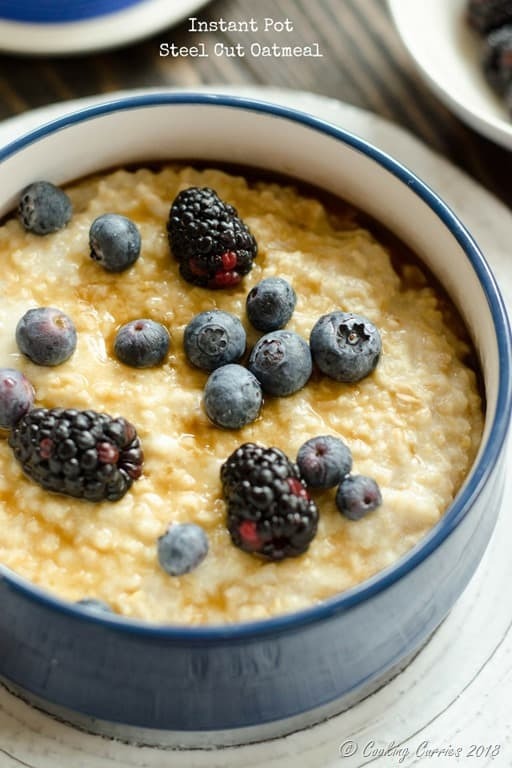 Toast the oatmeal in the Instant Pot on saute mode for 2-3 mins. Add the almond milk and mix well. Cook on Manual with vent closed at sealing position, for 10 mins. Wait for pressure to release naturally. (The little pin next to the sealing vent will go down once pressure is released). Move vent to "venting" position and open the Instant Pot. Add vanilla extract and mix well. 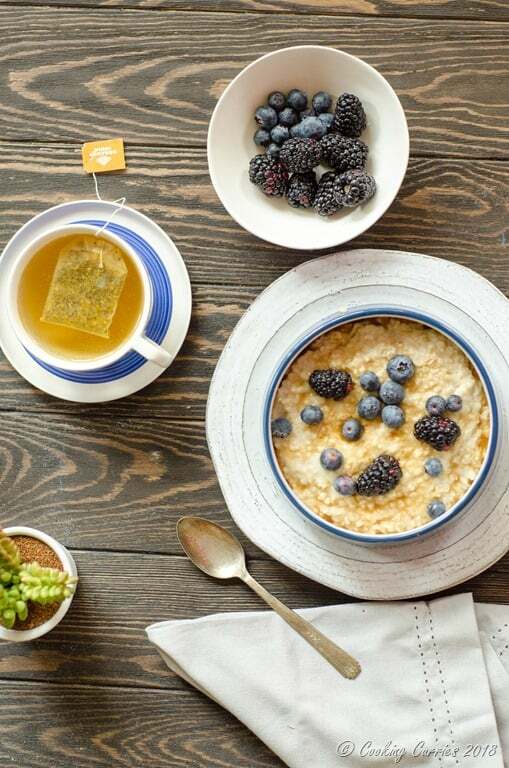 Transfer to serving bowls and top with maple syrup, your favorite fruits, granola and anything else you wish!